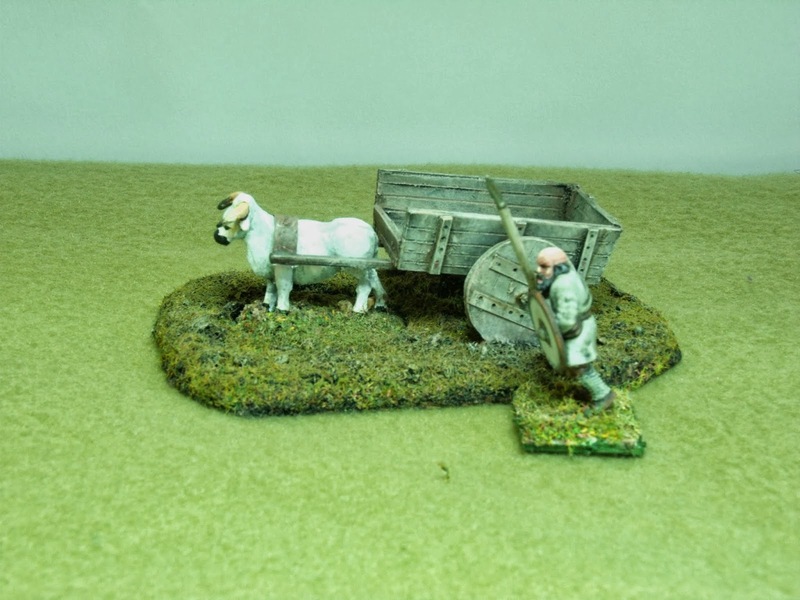 Wagons were essentially the only form of inland transport in Britain until the development of the railways and canals, and in point of fact continued to be significant right up until the twentieth century. 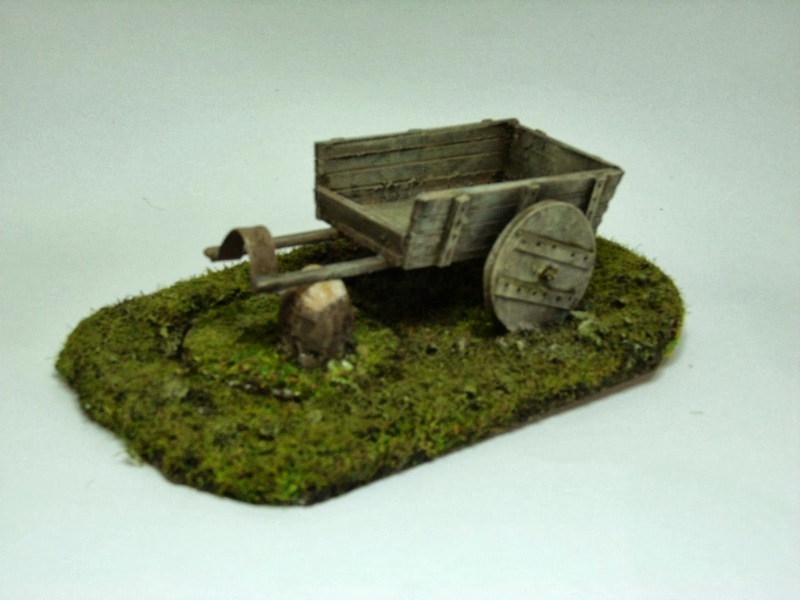 Wagons are therefore great for adding colour and interest to battlefields across a vast swath of time. Design obviously changed over time, but these are typical for the early medieval period. Hot on the heels of Paul's wagon build here, I started this one. Actually I was palnning this ahead of Paul's post, to fit in with the Dux Brit wagon train raid scenarios. 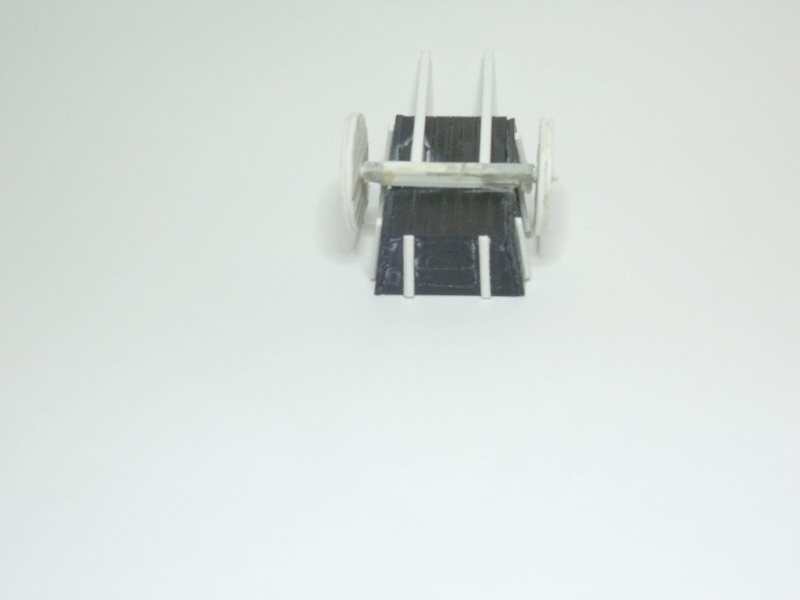 The wagon dimensions are fairly crudely done, without plans or drawings or any very formal structure. 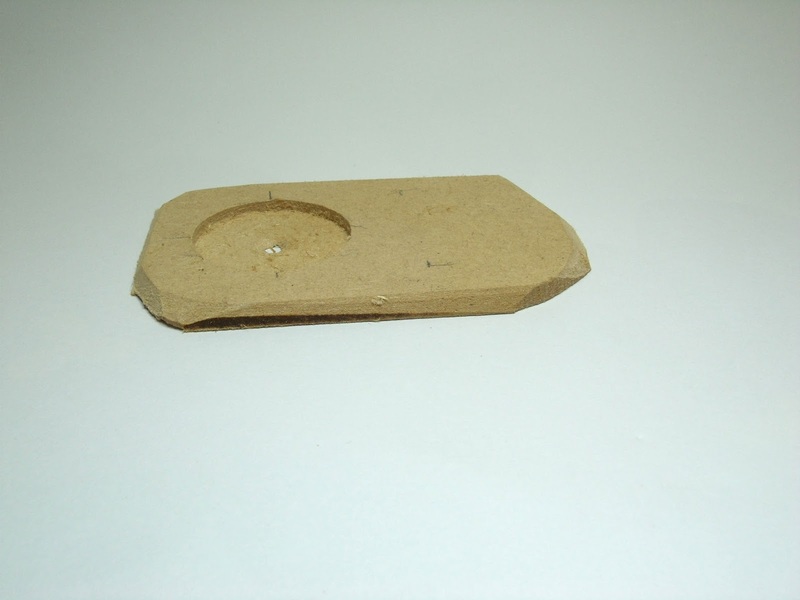 One oneline source gave me a measurement for Roman wagon wheels (about 1000-1200mm). Drawings of Roman two-wheeled wagons then gave me a set of proportions I could use: length of the body about two wheel diameters; depth of the body about half a wheel diamter and so on. 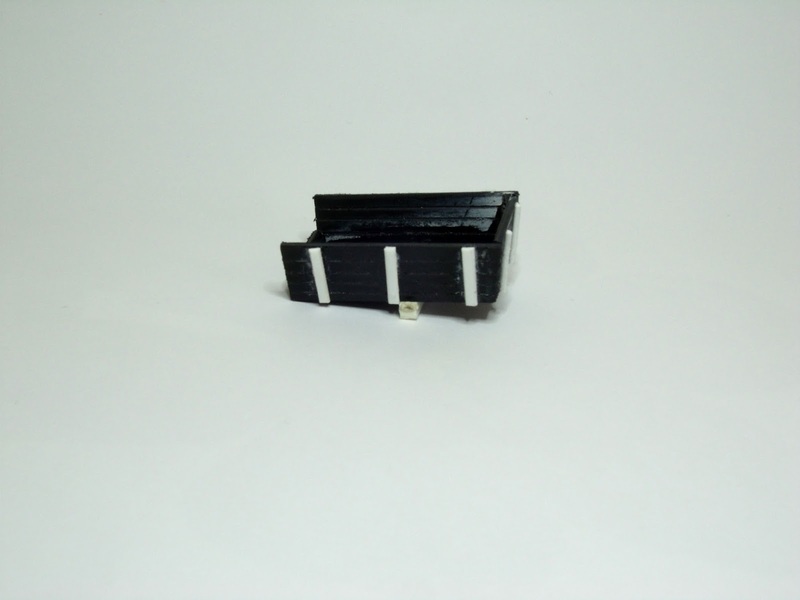 This is the body - the box is made up of five pieces of 60 thou plastic card, with plank detail engraved with a scriber and wire brush. The reinforcers are 40 thou card. 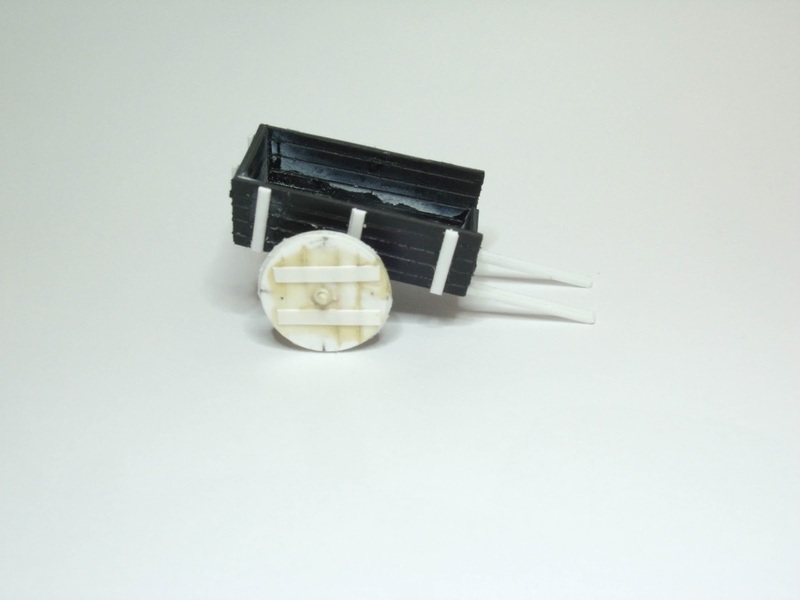 The axle box is laminated from several thicknesses and drilled for the axles. Here's another view, down into the body. 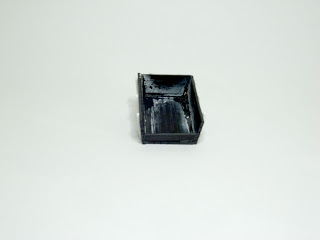 The whitish stains are from cyanoacrylate vapour - just like CSI! The wheels are simple discs. The Romans, Saxons and Vikings built spoked wheels, but these then disappeared from Britain for different periods. These very crude wheels, without iron tyres, represent a low point in British vehicle design and contruction not matched until the Austin Allegro in the 1970's! Two layers of 30 thou card, cut with a hole saw, are scribed for detail and sandwiched back to back with the plank detail at roughly 90 degrees on the two sides. 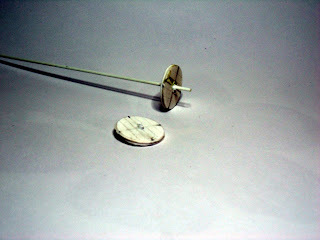 I added bushings from plastic tube, and the plastic rod will form the axle itself. 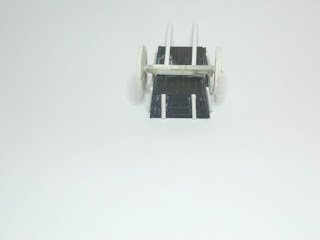 The axle stubs got glued in place, followed by the wheels. The bushings and axles were trimmed, and some details added to the ends to represent the pins holding the wheels in place. 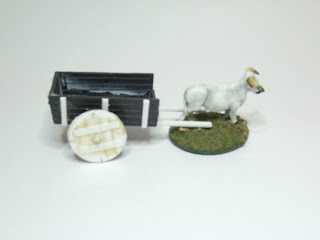 This piccy shows how the wagon looks next to the draft ox. Now, you could go with a complex harness, as close as possibleto what might have been used in real life. This has to be balanced against the need to be able to removed so the cattle can be used separately. So I went with the simplest possible harness - a single strap over the back, made from metalised plastic. 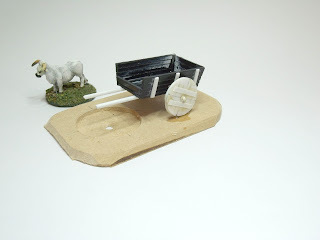 The basing was slightly tricky, as it had to be shaped to allow the pre-based ox to be in the correct position, account for the thickness of the bases, and allow me to use both ox and wagon separately when required. I came up with what I thought was quite a cunning solution. 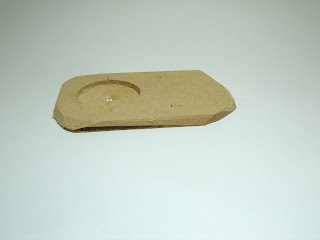 I roughly cut and chamfered a piece of MDF, then drilled a suitably sized hole partway through it with a Forstner bit. Next, I carefully aligned the the cart with the based ox in place, checked it twice, then glued the cart in place. 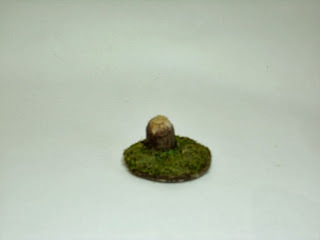 Then removed the ox, so that works, at least. A bit of caulk here and there on the base, and some sharp sand was followed by a coat of black primer over everything. The cart was painted mainly by drybrushing, with a few places touched in to represent metal and rust. The harness strap was glued in place and worked to represent leather. Flock, burnt umber wash and drybrush were followed by a few bits of clump foliage and static grass to fix the groundwork. So, here it is, ready to roll. But what happens when you want to use the oxen for something else, I hear you cry. You use this, is what you do. This little greebly sits in the recess, giving something for the cart shaft to sit on. Just like this. 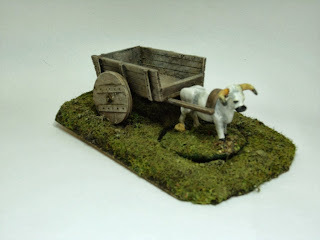 So, you can use the cart without the ox! At some point, I'll make some cargo (sacks, barrels, baskets and what not) to load on board. But it works well enough. 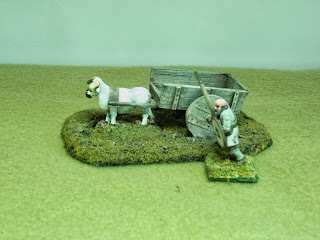 Here's the finished article, with a Sub-Roman levy attempting to get a bit more speed out of the delivery vehicle. He's not having much luck, though. Very nice tuto, looking so simple and so good! Proper job Mitch great work.